Denomination : Silver 1 real. Size : 26.5 x 26.8 mm. Weight : 3.24 grams. Grade : gVF, with a much nicer than average strike. Minor encrustation along one edge. Obverse : Crowned shield without flanking marks, with FERNANDVS ET ELISAB around. 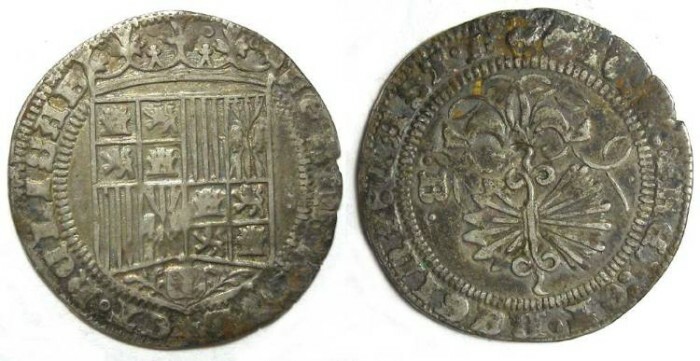 Reverse : Cluster of arrows with an ornate ribbon above, with REX ET REGINA CAST LEGIO A, with a B for Burgos in the field.